Broadway musicals have been a home for many heroes throughout history and this season is ushering in a whole bunch of them in the tightly-wound package of Newsies. The new Disney musical based on the 1992 movie tells the story of orphan boys in 1899 New York who, in spite of their destitute existence, demonstrate true power in numbers. 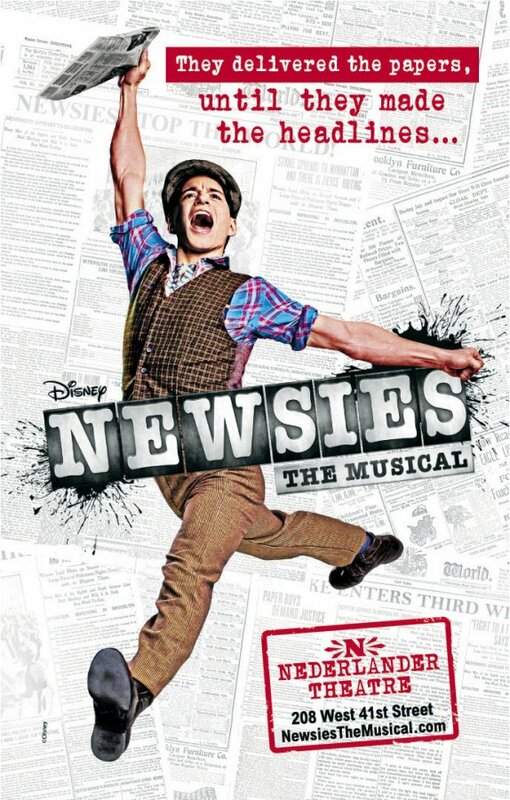 When newspaper mogul Joseph Pulitzer raises newspaper prices, the newsboys who sell the headlines, led by Jack Kelly (Jeremy Jordan), form their own union and go on strike. of Beauty and the Beast in 1994 and voiced Meg in the film Hercules in 1997, Egan has had young girls in awe ever since. In advance of her sixth solo album, The Secret of Happiness, being released on November 15, Egan talked with Stage Rush from her home in Los Angeles about her daughters’ favorite Disney Princess (it’s not who you think), being the punching bag of Broadway, and her future return to the Great White Way. How does this album differ from your others? Music speaks to me now in a different way than it did in my 20s, probably because I’m in a different place and I have a different point of view. The album is an examination of life, love, and how much more relaxed I am about all of it and letting things happen instead of trying to force them. I love that the album reflects how so many of the writers I first started working with in New York have also grown. They’ve gotten married and also had kids. I’m singing a lot of material from Jason Robert Brown, Georgia Stitt, Marcy Heisler. We’re all in different places and we’re all growing up together. The track “Nina Doesn’t Care” is about how your oldest daughter isn’t caught up in you being a Disney Princess. How does she convey this to you? For 13 years, the on-stage spectacle of The Lion King has been flooring audience members, even bringing tears to the eyes of adults, and selling out performances (even to this day). From an ensemble that is as important as the show’s leads (if not more), Jean Michelle Grier and Ray Mercer discuss life in this uber-technical show in the latest Ensemble Watch. Both ensemble actors with featured roles (Grier plays Simba’s mother Sarabi; Mercer plays a giraffe), they have both been with the show for over five years. Here they discuss the euphoria of being cast in the mega hit, backstage life at the Minskoff, and fitness. When was the last time you saw The Lion King, Rushers? Were you moved by its visuals? Do you find it interesting that this ensemble is arguably the prime aspect of this show? Leave your thoughts in the comments, and be sure to look for Part 2 next week. For on-the-go updates, news, and sightings, follow Stage Rush on Facebook and Twitter.